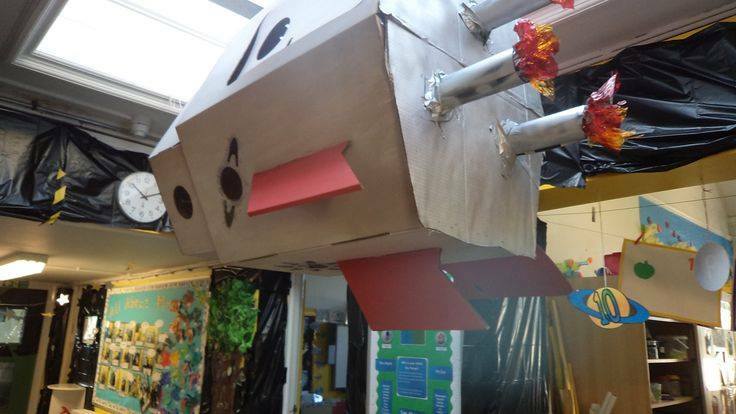 This was our hook at the start of a term, children came back after their holidays to a blackened corridor and a space rocket hanging from the ceiling, the doors to the rocket were closed, children investigated how the rocket had crashed into our classroom. The following week the children came back from the weekend to find the door was partially open and footprints had appeared… the children used the book corner to research what had come out of the rocket…. aliens, astronaut, maybe beegu? awesome start to the topic! Parents were hooked too! We bought the rocket from Amazon, we then painted it. Because of the good quality it spent a term in year 5 too. Its now packed up safely waiting to be re-used again!